If you look at recent statewide races, you see that Republicans have a 10 percentage point advantage, about 55% to 45%. That said, statewide races are close when the Democrat is highly qualified and has a clean record, and when their Republican challenger has a history of corruption or incompetence. Redistricting will have no effect on this,but it gives a sense of the population of Arizona. The same is not true in many congressional and legislative districts. We can easily find examples of blatantly incompetent and corrupt representatives elected in safe districts due to the dynamics of a primary election with too many or too few competitors. In safe districts, we find incumbents who are guaranteed reelection in all but the most extreme cases. Are vote splitting primaries with too many candidates vying for a safe party seat followed by term limits really the way we want to select our representatives? Competitive districts provide a safeguard against this.Competitive districts are not an advantage for Democrats. They aren't even an advantage for so-called moderates and centrists. They're an advantage for sane people. So is that what the draft maps provide? Not really. 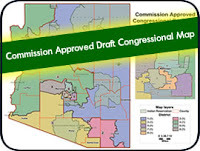 The drafts offer only a handful of competitive legislative districts. Less than half of the congressional districts are competitive. And how are the uncompetitive districts divided? In a state that polls at 55% Republican, of legislative districts with a 15 point spread or more, 65% percent are safe Republican seats. In a state that polls at 55%Republican, of congressional districts with a 15 point spread, 67% are safe Republican seats. So why are Republicans so upset with this map? They've controlled the state legislature for decades. Do these draft maps threaten that control? No. But if you think about, it makes sense. There is no such thing as enough for them. They follow an ideology that elevates self interest and greed above all other human values, even beyond the natural balance of these forces in a sane and healthy human being. They will never have enough. There is no way to appease them.